It is a well known fact that the vast majority of children learn the alphabet by rote. In other words they simply repeat the letters and learn them by repetition. The ABC song is probably the best example of this misguided conventional wisdom. The same applies to how most children learn the numbers 1 – 10. 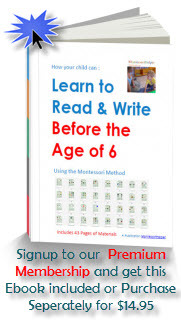 Since the alphabet and the number system are the most fundamental building blocks to all future language and mathematical learning in a child’s life… why is it that we do not allow the child to learn it in a way that aids comprehension, not just memorisation by repetition. In a “concrete” way where they will literally understand the difference between “1” and “2”, or “a” and “b”. Think about it, how is a child meant to comprehend what “2” actually means when all they have heard is someone say “2” and they have simply repeated it, much to the satisfaction of the doting parent or teacher. It is this very logic that is often the catalyst for “blocks” and learning difficulties with Maths and other subject areas in later years. 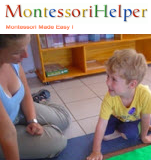 By contrast, one of the benefits of using the Montessori Method, for teaching the alphabet and numbers, is because she stresses how important it is to “internalise” a concrete concept first before building on that. As a foundation for writing and arithmetic a child needs to learn from concrete “sensory” experiences through the sensorial and practical life lesson activities. Through Sensorial activities which create this foundation a child can begin to learn the process of reading and writing (using the phonetic or “sounded” alphabet) and the process of counting starting the sandpaper letters and the large number rods. Once these processes are established via the Montessori Method, the child is then open to an unlimited field for future development. The video clip above is a simple example of word formation using the sandpaper letters and the phonetic alphabet. What the Montessori Method does therefore is to introduce the child to “abstract” concepts through the a process of “concrete” cognition. By contrast, in traditional methods (conventional wisdom) we attempt to teach abstract concepts not yet grounded by relevant concrete experiences, and these “concrete” experiences and the progression of them into the “abstract” are an absolutely vital foundation to enable a child to progress to abstract learning in the first instance. With the advent of abstract tools like computers, laptops, tablets and smartphones, the potential for “premature abstraction” is much higher than before and so we need to be especially careful when using apps and interactive tools. Not to say that all modern aids like these are inherently evil, but it is important to understand the principles of the Montessori Method first before incorporating these tools into learning. Similar to building a sturdy house, by applying the Montessori Method in Maths, we establish a firm foundation at a concrete level first, to prevent the house from being structurally weak over time, even if the house appears all in order from the outside. Your materials will be available there.